I'm running down to the wire this time on Linda Ledbetter's CC3C, So this will be a really quick post. Frosted Film is a challenging challenge because the Curiosity Crew and everyone who entered did such an amazing job. If you want to see for yourself go here. The sponsor for this challenge is The Funkie Junkie Boutique and you can visit them here. And of course as always you can find the technique I've used to create the lovely flowers in Tim's book A Compendium of Curiosities Volume III. Just check out page 59. Thanks for stopping by and if you have any questions just leave me a post. I'm going to bed now but I'll check back tomorrow! 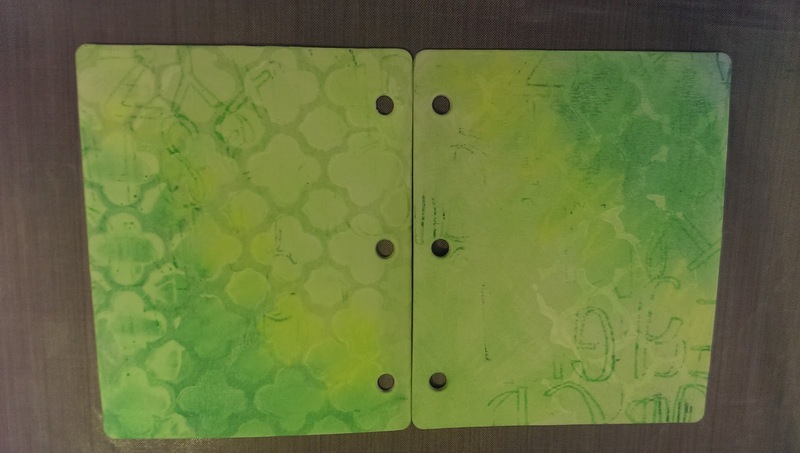 I just finished my second 2 boards for my Gelatos Art Journal. I was inspired by Mou Saha's July "Take the Challenge With Mou". 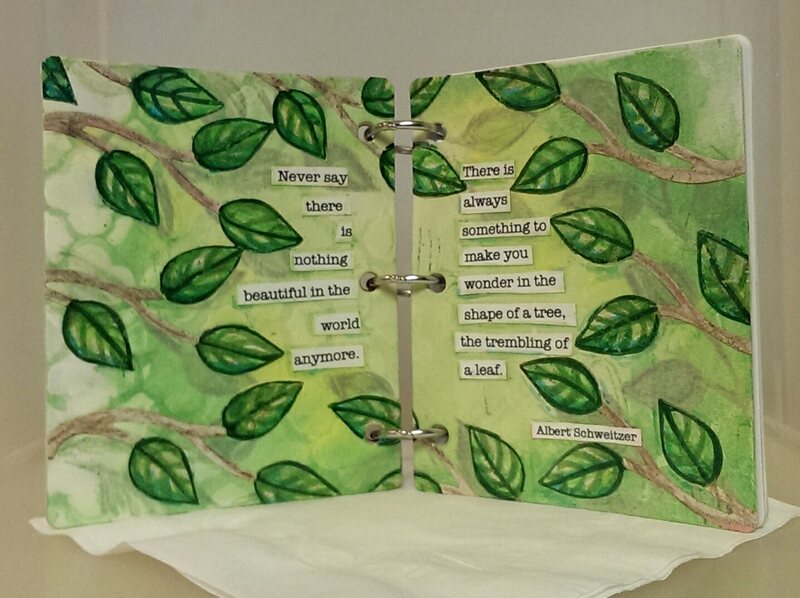 Her challenge for July was to use mainly Green. 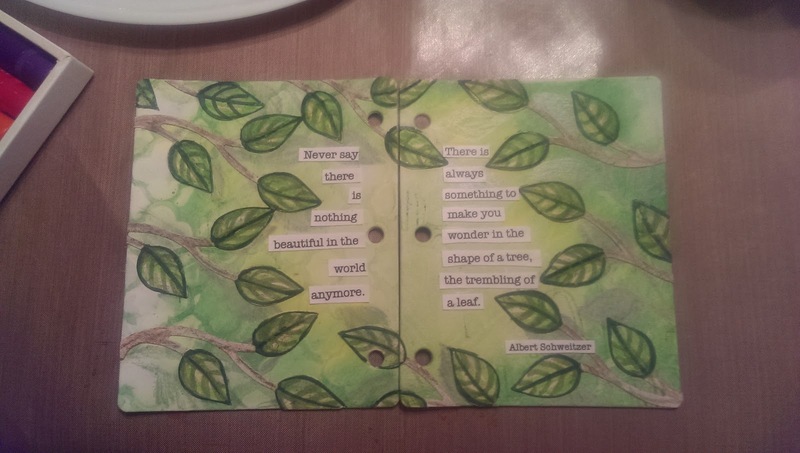 I decided to create a page centered around leaves. I love the beauty of nature. There is something peaceful for me to just sit in a shady spot, watch the wind blow through the leaves and hear the birds sing. I wanted to capture a little of that peace in my journal. To prepare my boards, I applied gesso through a 101 Stencil with a palette knife on the left page, applying the gesso heaviest on the left side of the page. 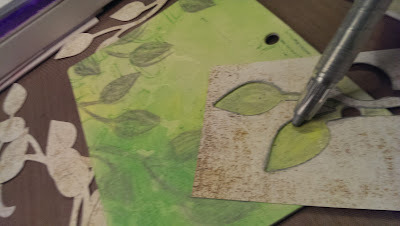 Then I flipped the stencil over and pressed it onto the board on the right to transfer the excess gesso. I wanted to play with the gelatos and see how they worked with the resist of the gesso compared to the surface of the plain board. 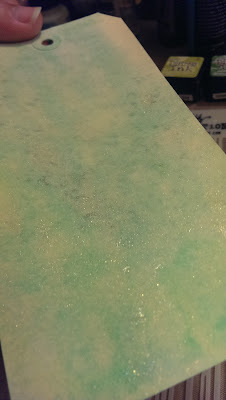 After allowing the gesso to dry I scribbled on my boards with my gelatos, using mainly green with a little yellow. I wanted the color to run diagonally across the boards. Using my finger to blend I only had to lightly mist with a little water to get the look I wanted. I worked on both boards at the same time, treating them as one page. I was able to wipe more color off the gesso areas using a baby wipe, making sure I kept switching to a clean area of the wipe as I worked. I could also let the color build up on the baby wipe and and use it blend the color in the areas not covered with gesso by using a lighter touch. I was careful not to over-work the board while it was wet to keep from damaging the surface. You can also use a heat tool to dry your board or set it aside and let it air dry. I used a Sizzix Originals die that had 3 leaves on a branch to cut out a bunch of leaves from some patterned paper from my stash. 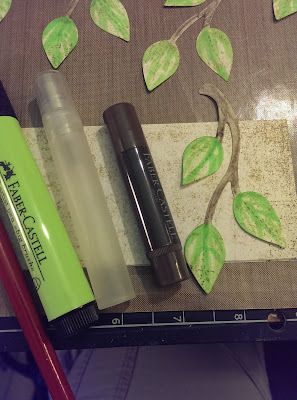 Since I used a heavy weight paper (probably Basic Grey) I was also able to use it as a guide to draw with my Silver Paper Crafter's Crayon, adding silvery leaves onto my background. I buffed the silver leaves with a dry paper towel to get a soft shine. I scribbled with a Chocolate gelato on the branches. I lightly misting them with water and blended the color a little with my fingers, letting some of the texture of the pattern show through. I then sketched in the lines on my leaves with a Light Green Big Brush Pen. 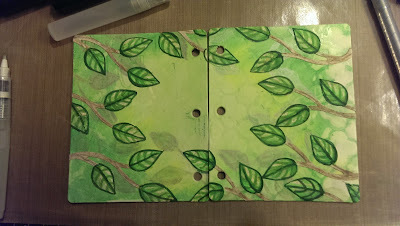 Once I glued the leaves to the board I used the May Green and Green Olive Big Brush Pens to add more detail to the leaves. 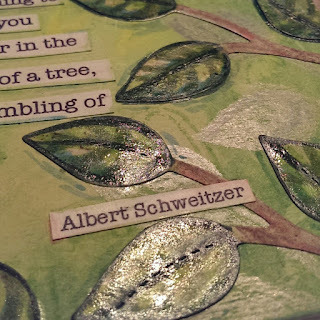 I found a quote by Albert Schweitzer I thought would be perfect for my art journal. "Never say there is nothing beautiful in the world anymore. There is always something to make you wonder in the shape of a tree, the trembling of a leaf." I printed it onto white cardstock, cut it into strips, glued it down and sealed it with gel medium. I scribbled some gelatoes into the wells of a palette, sprayed them with a little mist of water and mixed them up to make some water colors. I used a water brush to add more of the colors to the leaves, branches and edges of the word strips. 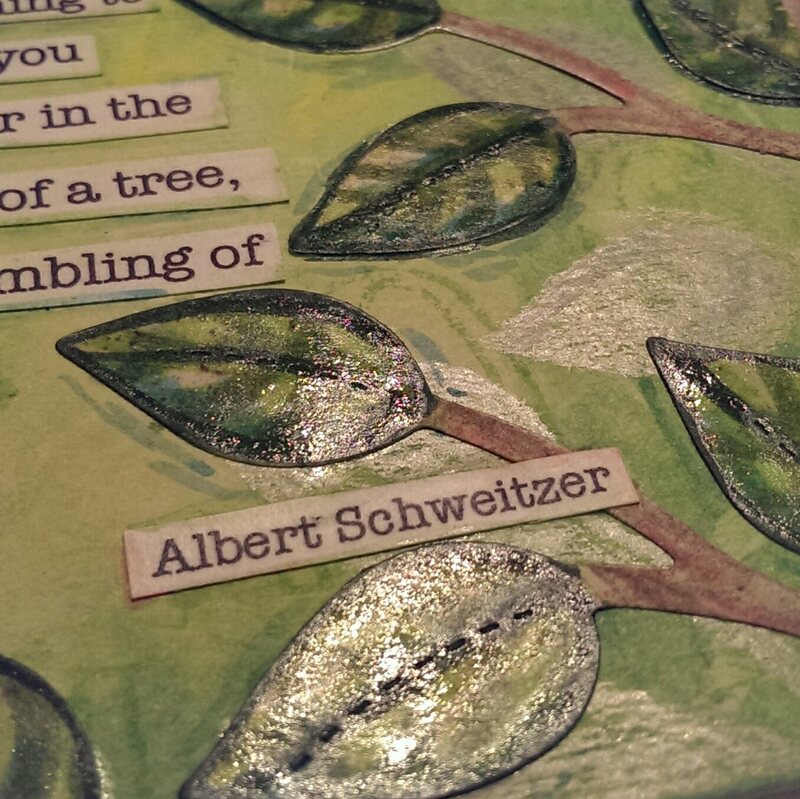 Shine on the green leaves is glaze, The silver leaves are buffed silver crayon. Once everything was dry I used a small flat (dry) paintbrush to add glaze medium to the leaves. I love the shimmer of the glaze on the leaves. Just enough shine to highlight and enhance the color but not as glossy or dimensional as glossy accents would be. The added shimmer of the silver crayon is subtle and looks like shadowy background leaves, adding another layer of depth. Every month Mou Saha has a challenge on the Faber Castell Design Memory Craft Blog. I hope you hop over to Take the Challenge with Mou and see her beautiful page. You still have time to enter. Usually the challenge runs for 2 weeks but this months challenge is running a little longer so you have until Sunday, July 26 to enter. 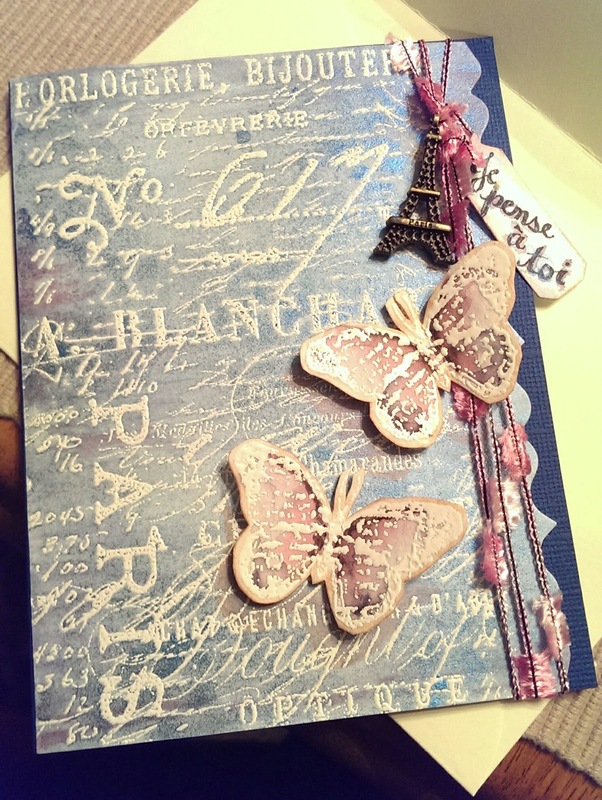 An art journal is a great way to play with different products and techniques. I had a Faber-Castell mini board journal I had won in their February "Take The Challenge With Mou" monthly challenge, so I decided to start an art journal for my gelatos. 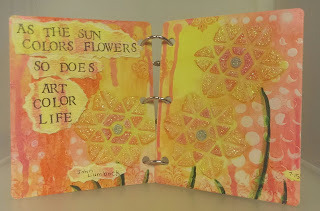 Since Summer Sun and Sunny Flowers were the inspiration for my first pages of my art journal, I decided to enter my pages into The Mixed Media Monthly Challenge # 14 - Summer Days, which runs through July 31st. Along with my gelatos, I used quite a few different techniques and products, almost all are part of the Faber-Castell Design Memory Craft line. I started by covering the entire surface of two of the art boards with gesso. Once it was dry I used a stencil from their 101 collection that had dots that went from small to a medium size and applied some gel medium with a spatula. 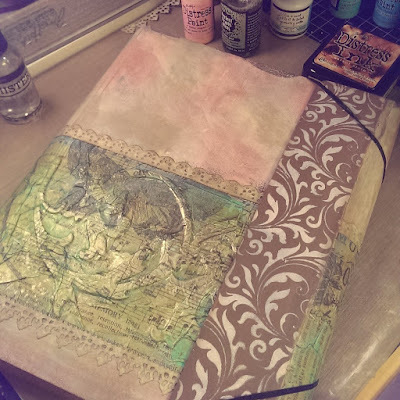 The gel medium added texture and worked as a resist. Then I set my boards aside to let it dry. A quick word about the Faber-Castell stencils. 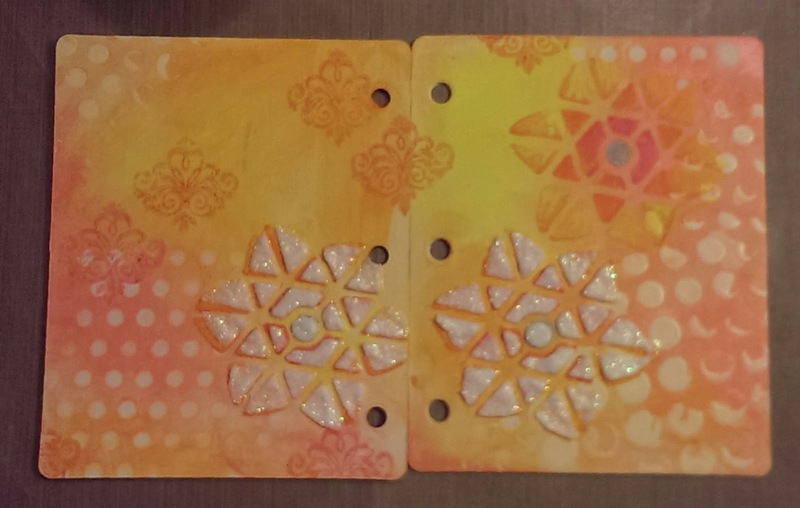 You can purchase sets of stencils or they may come in one of their kits. They are made of chipboard so do not hold up well if saturated with water but the gel medium and paste worked fine with them. I decided to use a spray sealer on my stencils and that seems to be working fine for me. Applying the gesso to the boards allowed the gelatos to blend easily and be lightened or removed entirely with baby wipes. I picked some yellow, pink and orange gelatos and scribbled color on the boards and then blended with my fingers. 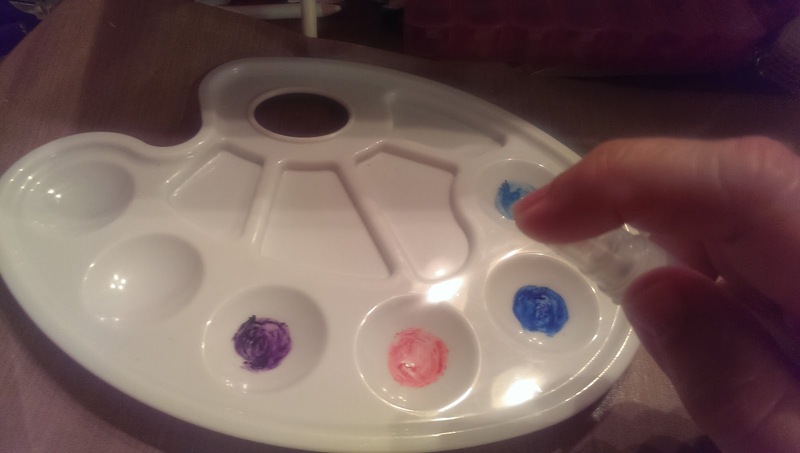 You can also moisten your fingers with a little water to help blend the colors. 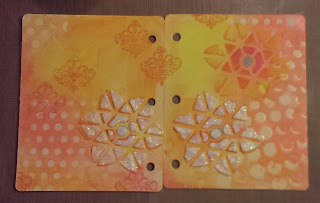 I used a small dot stencil from the Mixed Media With Gelatos kit and baby wipes to remove some color across the top of the right board and lower left corner of the left board. 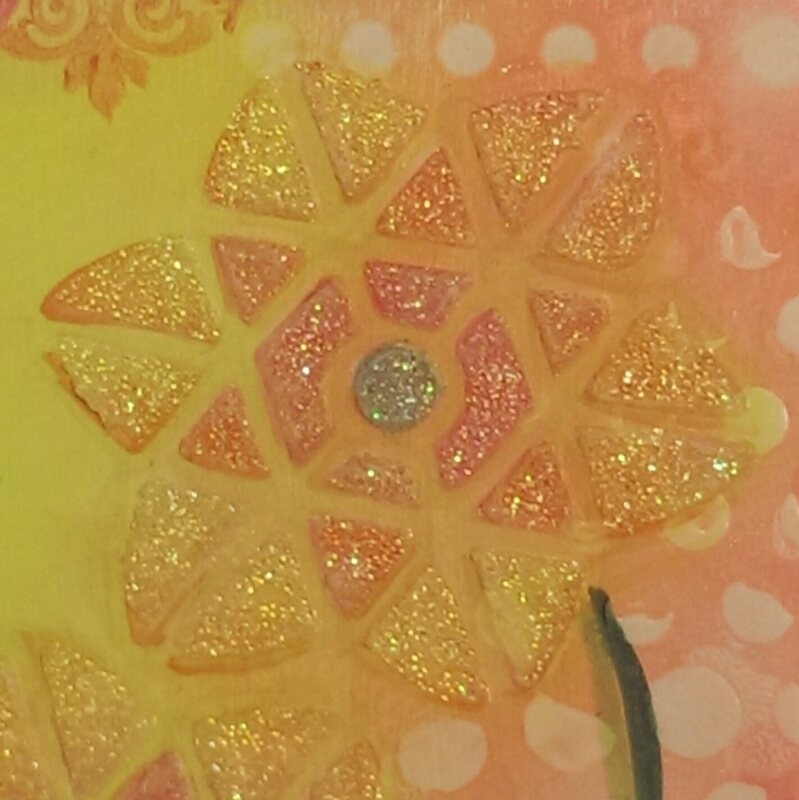 The other dots are from the gel resist. 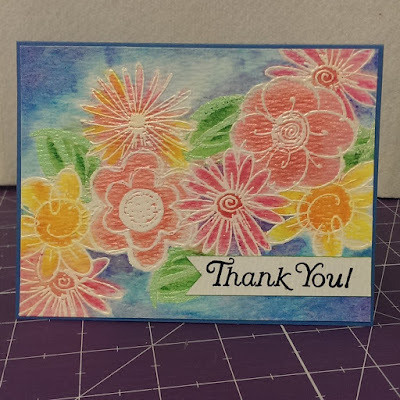 I used the flower stencil from the same kit still working with the yellows and oranges applied the gelatos with my finger tips to blend, then added some details with Stampers Big Brush Pens. I used a Faber-Castell papercrafters silver crayon to fill in circle in the center of the flower. 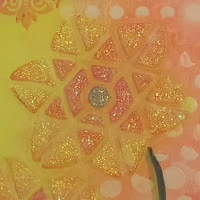 Once I had my flowers the colors I wanted I added some Glass Bead Glitter Gel through the stencil. I had to let it dry before adding it to the 3rd flower. In the picture you can see the gel is white and opaque when applied. It dries clear and glittery and very textured from the beads. Glass Bead Glitter Gel dries clear. Then I inked up a flourish stamp with Stampers Big Brush Pens and stamped to add some more texture to the page. I put my pages aside for a few days while I worked on some other projects. When I came back to my art journal I was having so much fun I forgot to take pictures but here is how I finished up. First I decided my flowers needed stalks so I quickly drew them in with Light Green and Green Olive Stampers Big Brush Pens. Then I mixed some gelatos with whipped spackle and applied it to the left page with a spatula to add more texture and deeper colors. 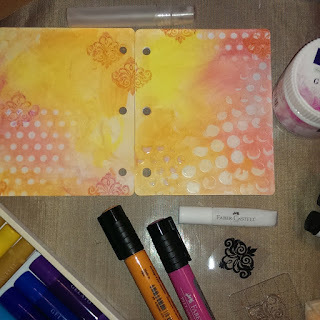 Next I used my yellow gelatos on some Tim Holtz water color paper. I also used the dropper tool to add some drips of Metallic Melon Gelato mixed with water to the water color paper and across the tops the journal pages. I hand stamped my quote inking up my alphabet stamps with a black Stamper's Big Brush Pen. I tore the paper from around the quote and used a glue stick to glue it to the left page. The white edges looked a little too bright so I added some water to the yellow gelato on my kraft sheet and applied the watercolor to the torn areas with a brush. For the final touch I added some white gelatos to the flower petals inbetween the stenciling and then once dry applied the Yellow Stampers Big Brush Pen. This brighten the flowers up a little and mdke them a little sunnier. 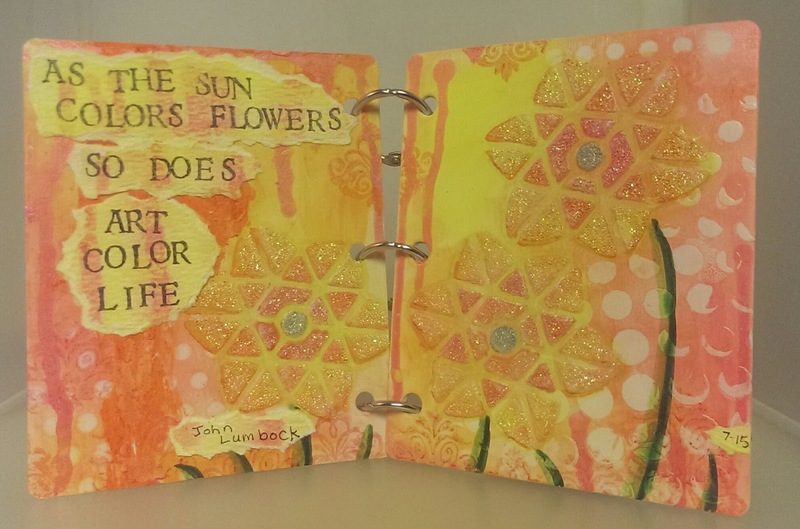 For the month of June the folks over at Faber-Castell Design Memory Craft had a Art Journaling Month where they had 5 members of their design team post tutorials each week showing how they created their art journals. By the end of June I had seen quite a few fun ideas for using my Gelatos. If you are looking for ideas on how to use their products their blog a great place to start. You can see Mou Saha's completed journal on her blog here. I hope everyone is having a fun holiday. I have had some fun time with my family earlier today. We went to the movies and then my husband cooked some of his wonderful hamburgers and home cut fries. He is an amazing cook. While he cooked I worked on my July 12 Tags of 2015 tag. I had made the plaid background using Tim's plaid technique from June and for the rest I wanted to follow Tim's tag as close as I could but I did have a few little variations. For the 4 and the stars I used some grungeboard shapes in my stash. I bought so many sets when they first came out I may never run out. I dabbed some White Distress Crackle Paint on them and let them dry during dinner. Once we were through enjoying our meal the crackle paint was dry and I was able to put everything together. 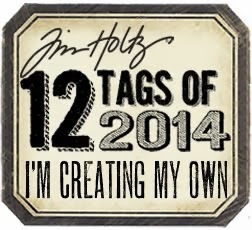 Here's my tag for this month. I think this may be the earliest I have ever finished one. I Love seeing Tim's July 4th projects every year. Check out Tim's tag at 12 Tags of 2015 for July and his post for Patriotic Inspiration for some more ideas and his great tutorials. Here are just a few of the projects I completed this month while enjoying Kathy's challenge. During the month of June I would visit Kathy's blog. There was always something new. Some days she posted a card or a technique filled video and some days she would have a give away. I started strong with the goal of coloring something everyday. I posted my work on Instagram with her hashtag #thedailymarker30day2. I did color something most days and made several cards. 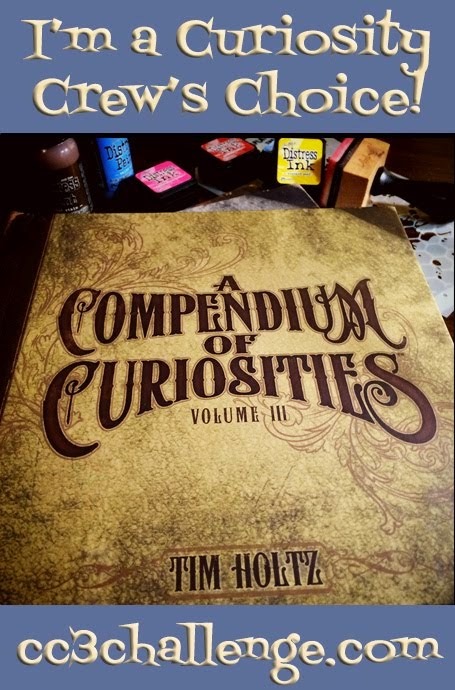 I also worked on my Collection Folio using some of my favorite techniques from my copy of Tim Holtz's first book "A Compendium Of Curiosites". 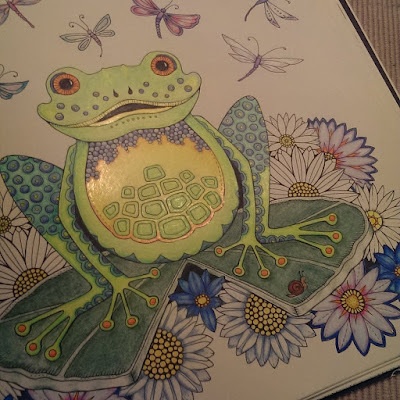 I also colored in my copy of "Enchanted Forest" by Johanna Basford. 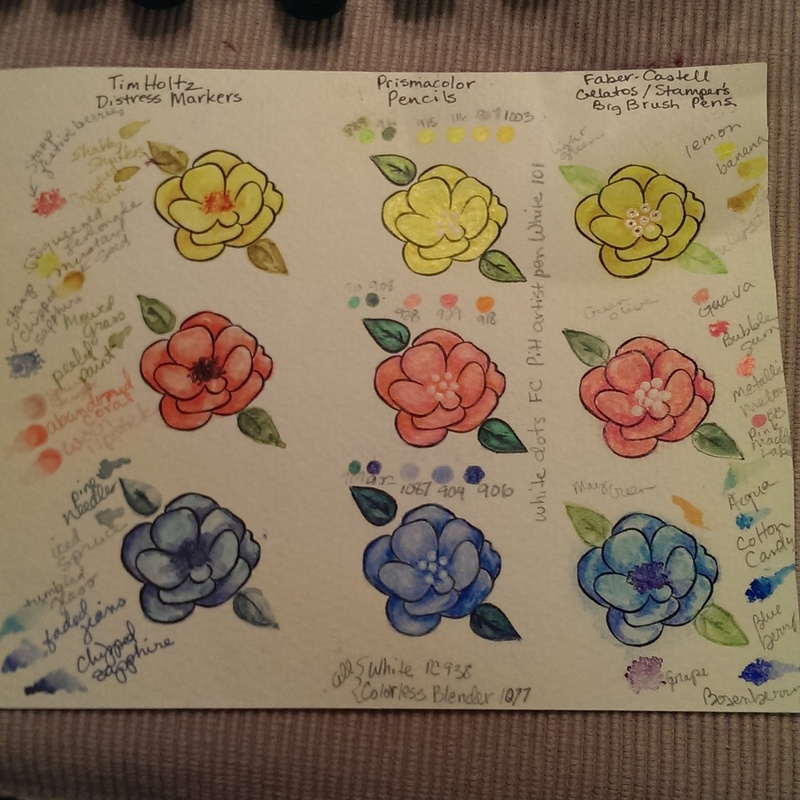 One day Kathy posted a Copic marker color combo comparison chart. Since I don't used Copics, I decided to make a little chart comparing my favorite coloring mediums. Even when Kathy is using her Copics I learn a lot from her about color combinations, shading and lighting, blending, design and composition. Kathy makes beautiful cards. It has been a fun month for me as far as coloring goes. Well actually June has just been an all around fun month. Not only have I been able to spend a lot of time coloring, I have been able to spend time with family, some of which I haven't seen in a while, celebrated my sister's birthday with her and visited with old friends. If you like to color stamped images and especially if you are wondering about Copic markers or water coloring techniques be sure to check out Kathy's blog The Daily Marker. 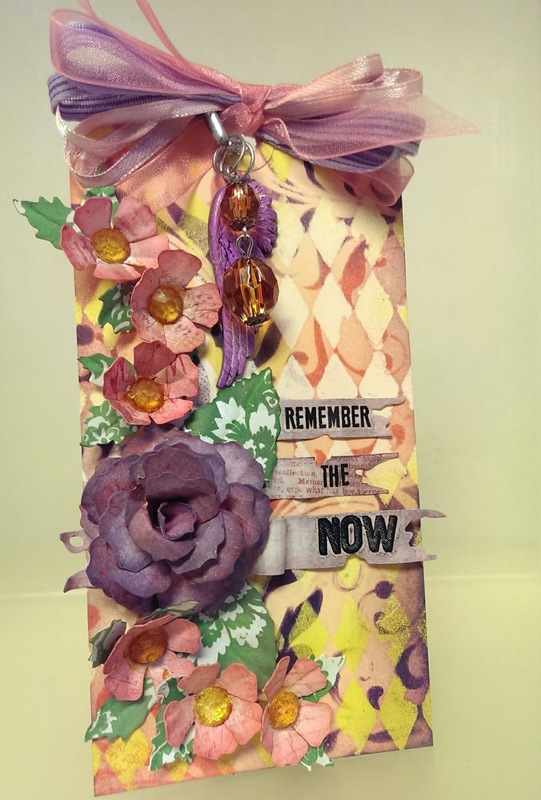 And here is a link to her compilation of the challenge with the cards she created each day along with links to each post http://www.thedailymarker.com/2015/07/wrap-up/. While you're there be sure to look around. Kathy is always posting something beautiful on her blog. After all she loves to color and she is very good at it. 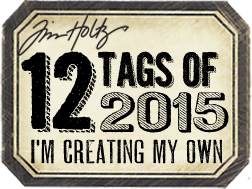 June 12 Tags of 2015 - Coffee! So What's Your Favorite Brand of Coffee? 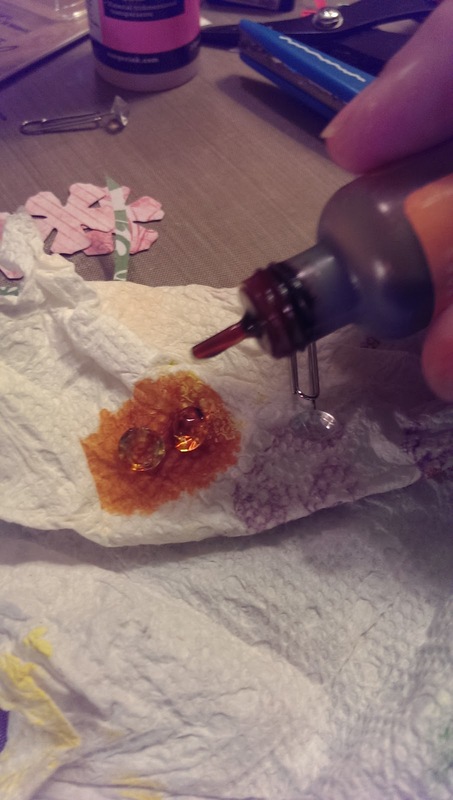 I grew up with the "Good To The Last Drop!" coffee in my house. It's still my favorite. However Tim, Mario and my coffee drinking daughter Sarah are fans of another brand. If you are a Tim fan you know which one it is. When I saw Tim's tag this month I knew I had to make it. I really lucked out this time too. I don't have the coffee die but Linda at The Funkie Junkie Boutique encloses little goodie bags in her orders. I always find fun little surprises in these gift bags. I remember that she had enclosed a set of the coffee diecuts in the goodie bag with my last order. (Thanks Linda!) It was before Tim posted the June tag so it was just turned out lucky for me that I hadn't used them yet. The pieces Linda sent me were white except for the corrugated band and the acetate top. I think the white cup turned out great on my tag. I followed most of Tim's directions with a few changes here and there due to what supplies I had on hand. I was so excited when I saw Tim's plaid. I was able to recreate my plaid using Distress Minis with his Stripes Layering Stencil. 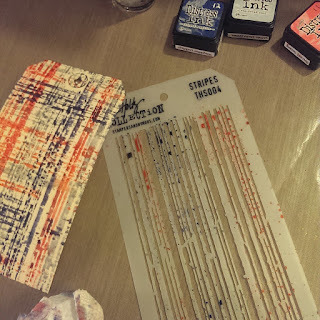 The first tag I did was with Festive Berries, Weathered Wood and Faded Jeans. I loved the way it looked but quickly realized that I had skipped Tim's first step. When I realized what I did (or didn't do) I decided to start over. One reason was because the technique was so quick and easy. Another was that I really need to play more with my Distress Sprays and finally I decided to use shades of greens. 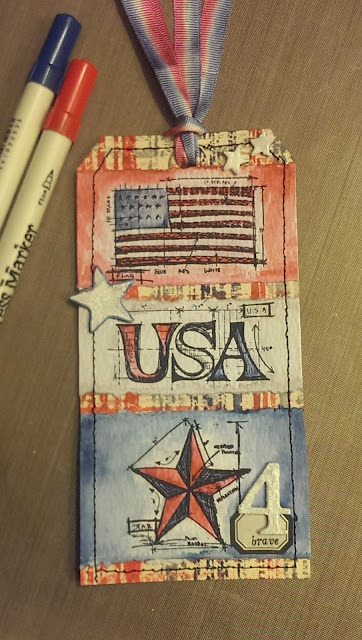 I'll use my Red, White and Blue tag for a July project. I spritzed my tag with water then Cracked Pistachio Distress Stain. I decided I wanted a little shimmer so I used Perfect Pearls Mists in heirloom gold instead of plain water for the drips and splatters step that was next. 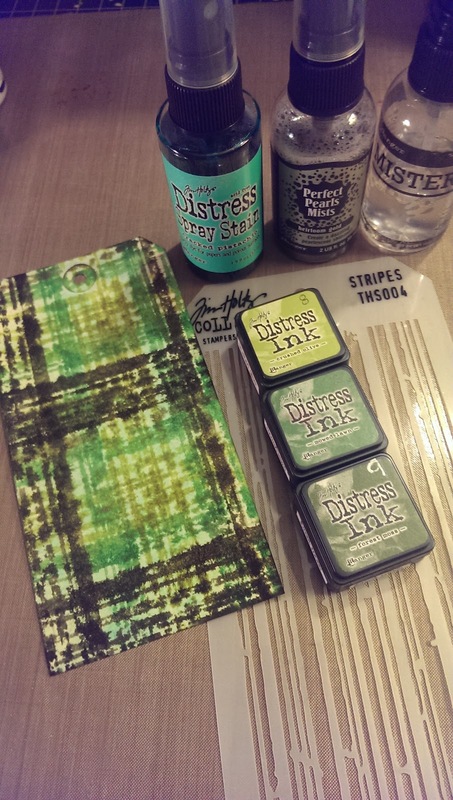 The colors of Distress Minis I used for my plaid were Forest Moss, Mowed Lawn and Crushed Olive. I wanted a heart where Tim used a star. I freehand cut one out of Clearly for Art Modeling film by Wendy Vecchi. I painted it with Brushed Pewter Distress Crackle Paint and when it was dry added drops of Watermelon Alcohol ink. I still don't have any of Tim's burlap so I used fabric from Tim's Eclectic Elements Line. 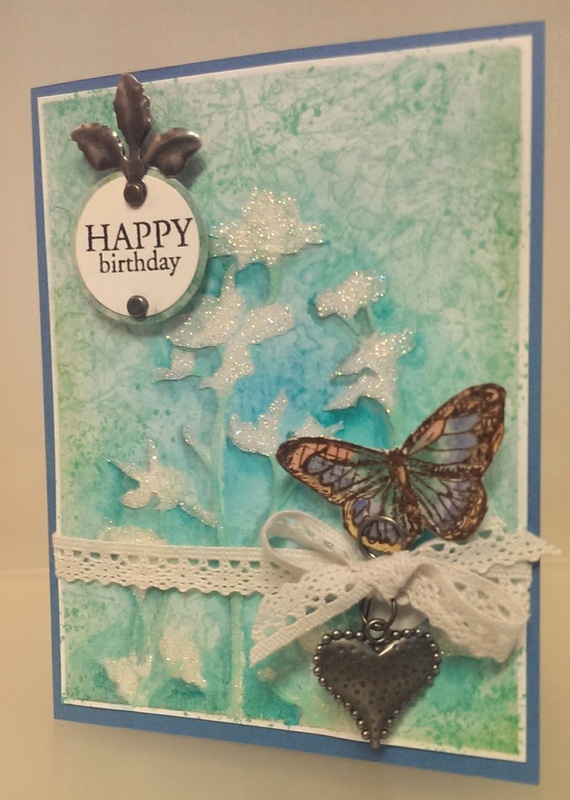 The phrase I used is from Tim's stamp set Way With Words CMS165 from Stamper's Anonymous. I always find such wonderful inspiration and tutorials at Tim's blog. If you want to see Tim's June tag and check out his great tutorial click here. Another place to get ideas for using Tim's products is the Ranger Ink blog. If you'd like to see some fun projects the Ranger Artists created after being inspired by Tim's June tag click here. I had such fun working on my entry for Challenge #31 at Linda Ledbetter's Compendium of Curiosity 3 Challenge. Layering Stencil: Paint Resist that I posted a couple of photos of my work in progress shots on Instagram. Did you see them? 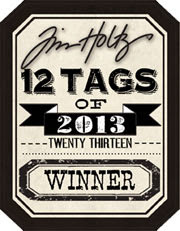 Here is the completed tag. The background of my tag was created using the technique from page 47 of Tim Holtz's "A Compendium of Curiosities Volume III". 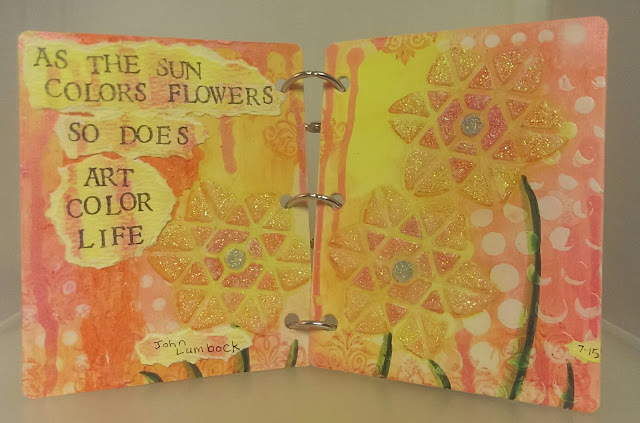 I used Picket Fence and Mustard Seed Distress Paint and Spun Sugar, Worn Lipstick, Dusty Concord and Squeezed Lemonade Distress Ink along with the Harlequin and Flourish Stencil but as to how I did it you will need to check your own copy of the book. Rules for the challenge are here and loads of inspiration for the technique is here. Sponsor of this challenge is Inspiration Emporium. They are generously donated a $50 gift certificate that some lucky winner can use to purchase some more goodies. If you want to check them out click here. I realized I needed more of the smaller flowers. After finishing my base tag, I decided to create some flowers using one of my favorite dies, Tattered Florals. 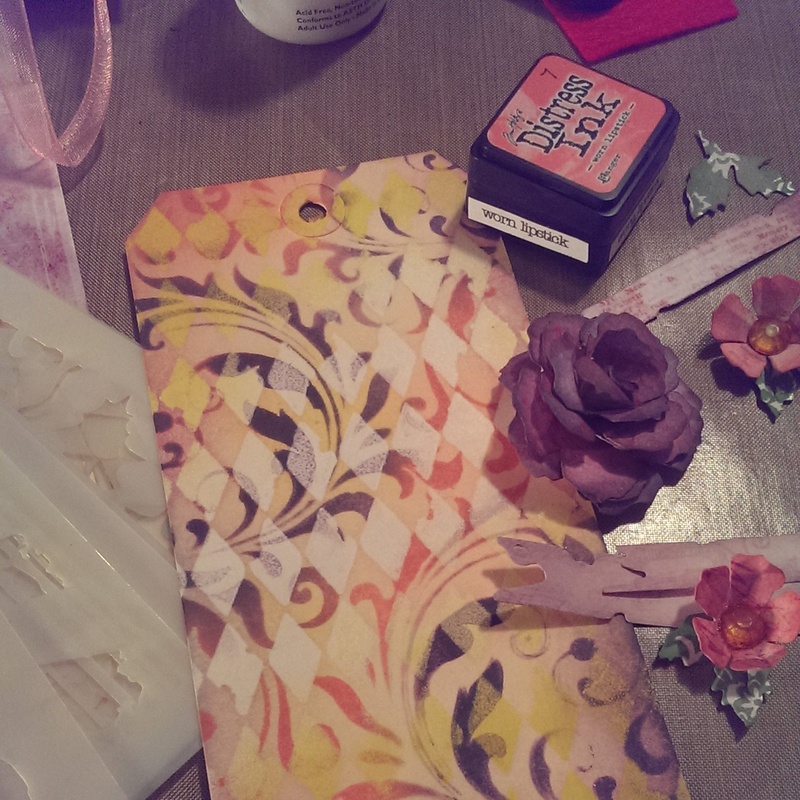 I used the pink pattern paper from Tim's Vintage Shabby Paper Stash. For the smaller flowers I used the smallest flower on the Tattered Florals die and after inking it up and shaped the petals with my fingers. For the centers I took the gems off the ends of Tim's Idea-ology "Gem Clips" and colored them with Butterscotch Alcohol ink then glue them into the center with Glossy Accents. 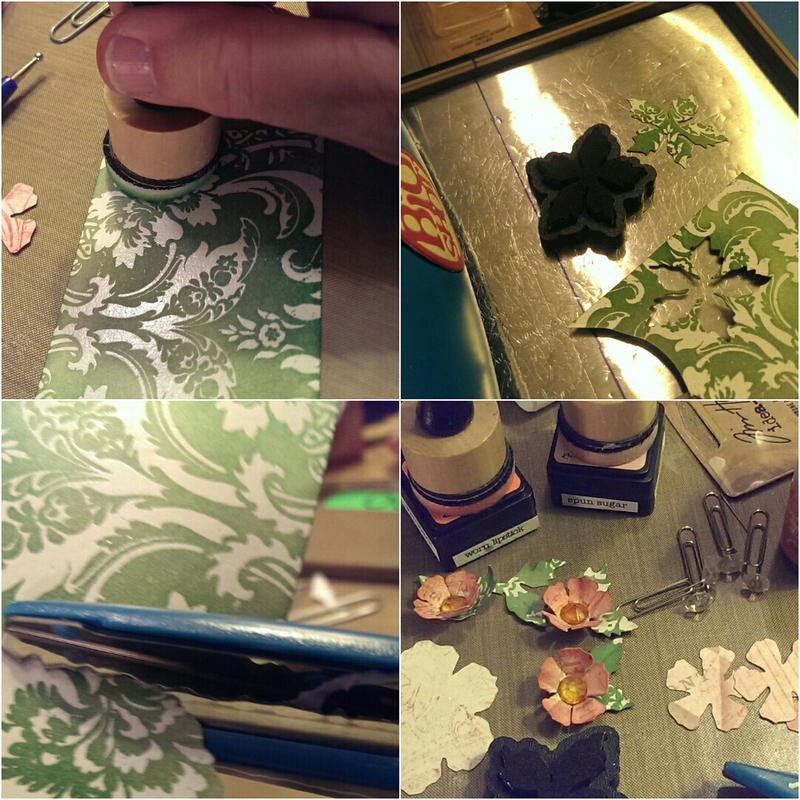 The leaves for the smaller flowers are die cut from the Motif paper stash which includes both white and kraft colored paper with varnished designs that resist ink. I inked the paper up with Bundle Sage and Mowed Lawn Distress Inks, then die cut them with the small Poinsettia mover and shaper die. I cut each poinsettia into sections with 2 petals for each flower. For the larger leaf, I hand cut a leaf shape using my very old deckle edged scissors. (I started scrapbooking when these were cutting edge technology!) I glued the leaves to the flowers. Once everything was dry I started playing around and arranging the flowers. 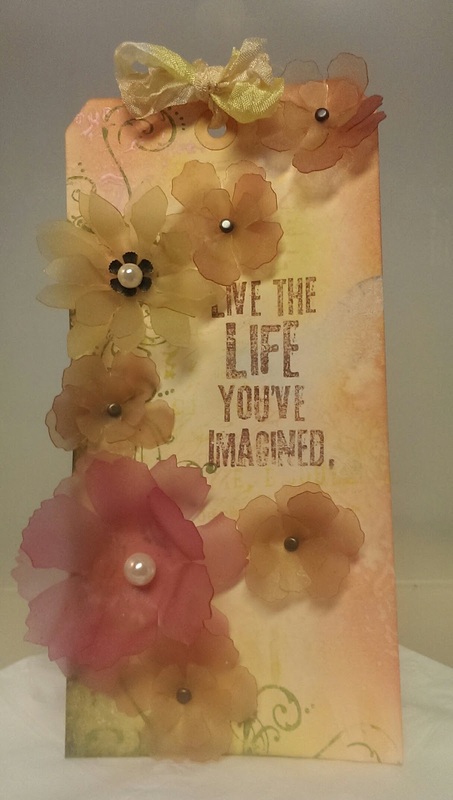 I used the Tattered Floral Die for the large rose. 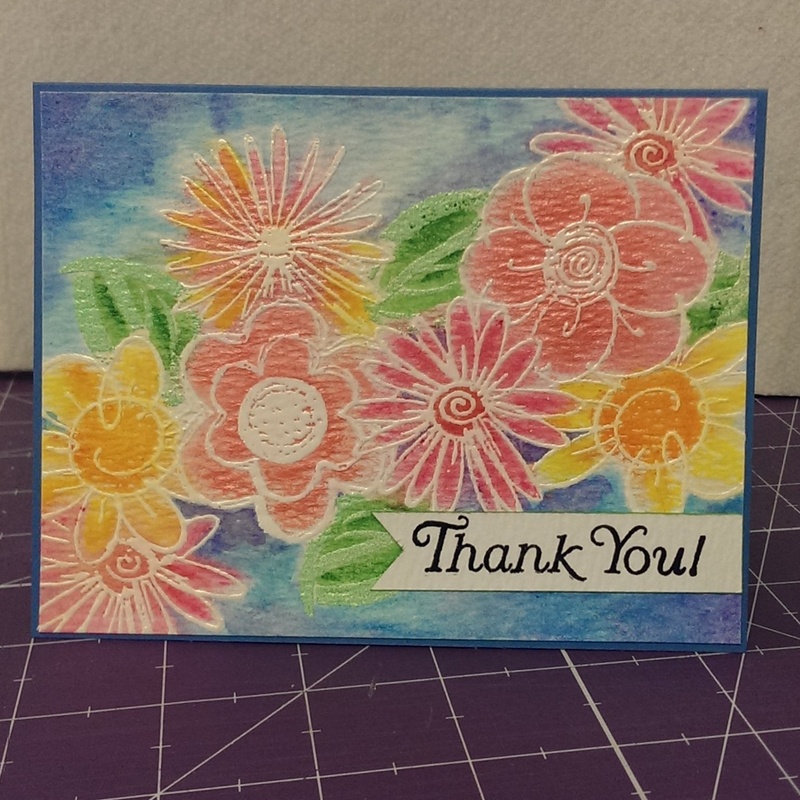 I used Dusty Concord Distress Ink and a blending tool over the Vintage Shabby die cuts. I won't go into all the details here but here is a link to a really good turorial by Hels Sheridan, one of the Curiosity Crew members, for a large rose. It's not exactly how I made mine but really close. I used the Tattered Banners die and Remnant Rubs to create my banners, and finished up my tag by adding a few Idea-logy embellishments colored with alcohol inks and of course a ribbon bow. 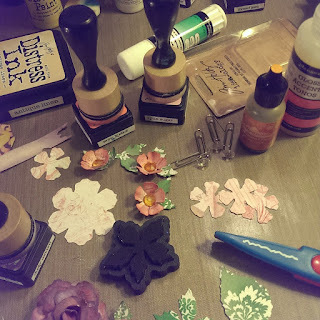 My Layering Stencil: Paint Resist tag before I started putting everything together. My husband and I live a little northeast of Atlanta GA. We were both born in Georgia and have always lived in this area. I have one son, two daughters and a beautiful grandson. 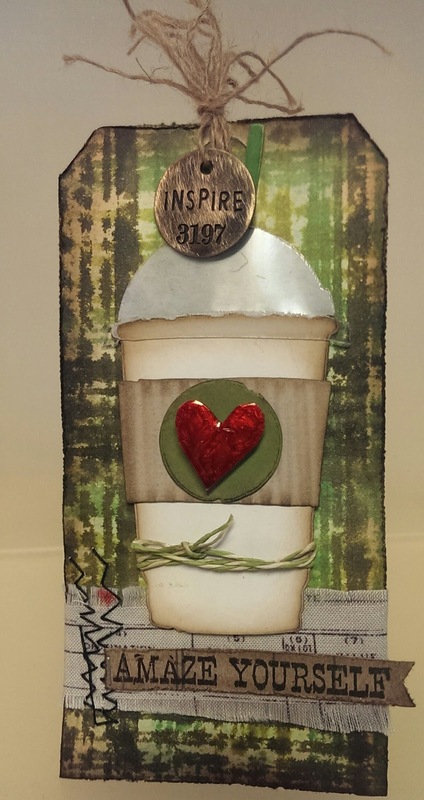 Linda Ledbetter's CC3C - Join the Fun! New Challenge Every 2 Weeks! I'm so Excited - Thanks Kim! Follow Ruby's board Handmade on Pinterest. — with Tim Holtz and Mario Rossi.